Although this is an interesting and thought-provoking book, the author, Joy Hancox, unfortunately falls victim to "Von Daanikens syndrome" where wishful thinking and pre-determined conclusions replace facts in the presentation of opinion masquerading as theory or proof. The basic premise of the book is founded on the authors accidental discovery of a small collection of detailed drawings dating from 1570 to 1730. The collection was compiled by John Byrom (1692-1763) an English poet, hymnist, and inventor of a system of shorthand, as well as a student of religious mysticism. Hancox believes that the geometric patterns found in the drawings represent an astrological underpinning for the construction plans for a number of churches as well as for Shakespeares Globe Theatre. While the author spends more pages detailing the process of discovery and her researches, and how her ideas and theories came to her, than she does examining the actual drawings, she fails to prove any of her assertions. The danger in books such as this lies in the careless reader assuming that they provide some form of proof regarding various interpretations of Freemasonry. In this case, both freemasons of an esoteric bent and anti-masons convinced of Freemasonrys occult roots will believe they have found further argument that Freemasonry is, or was, closely linked to astrology. John Byroms name appears in the list of 1730 as a member of a lodge held at the Swan, in Long Acre. [AQC vol. xxi p. 233. That Byrom was a freemason and that he associated with the founders of modern Freemasonry does not prove that astrology was incorporated into the teachings of Freemasonry. Freemasonry teaches its voteries to explore the liberal arts and sciences which includethrough mathematicsastronomy and astrology. But this doesn't mean that Freemasonry incorporated astrology into its teachings or practices. Yes, leaders of the masonic revival, James Anderson and Desaguliers were part of Byroms circle of friends and associates. But this proves nothing. Hancox notes that Byrom "writes in his journal that he told the Sun Club he was going to establish a Cabala Club." Without a single other citation to this club, Hancox makes numerous allusions to its assumed membership and meetings. She admits "an unexpected silence about the further meetings of the Cabala Club" [p. 13.] but appears to keep mentioning it as an excuse to repeatedly use the word "cabala". She suggests that Byrom "included [the collection of drawings] with others as source material for study at his Cabala Club." [p. 124.] She then writes: "I later came to the conclusion that this group met in London in rented accommodation to discuss the drawings." [p. 295 n2,2] And then rhetorically asks "...had the Cabala Club gone underground?" [p. 13.] She doesn't consider the possibility that the club never existed except in casual remarks by Byrom to his friends. Hancox writes "It seemed evident to [an unidentified librarian at the Theosophical Society] that the group using the drawings had come to a halt, otherwise they would have been passed on by Byrom to his successor." [p. 17.] What group? Theres no membership list, and no record of its existence. Hancox has not really demonstrated that any of these drawings had any bearing on the original construction of these buildings. I'm reminded of the once closely held belief that since the measurements of the Great Pyramid could be equated with pi, that its architects must have been familiar with pi; or the 19th and 20th century fascination with deconstructing older texts such as Shakespeares plays or the books of the Bible to create imagined codes to prove whatever theories the author held most dear. Two quotes exemplify the level of supposition and conjecture underpinning the whole book: "One of the drawings has a most unusual watermark in the shape of a pentalpha." "Its presence as a watermark must mean that the paper-maker was either a freemason or a Rosicrucian" [p. 167.] Maybe, maybe not  the pentagram appears in few Rosicrucian texts, and had other diverse meaning and uses during the period. Hancox later claims "...its connection with the Royal Society and Byroms Cabala Club. In the centre is the six-pointed star, which immediately links it to the masonic movement...." [p. 172.] Yet the six-pointed star has no specific or unique association with Freemasonry, and similarly had other diverse meaning and uses during the period. Hancox further suggests "Alternatively [the collection of drawings] could have been lodged with a secret group within the Royal Society." [p. 231.] It is easy to make conjectures. But I don't see anything that convinces me that this is anything but idle speculation. Hancox has discovered an interesting historical curiosity and her theories are as valid as anyones. Her theories regarding the Globe Theatre have aroused some controversy but are beyond the competency of this reviewer to comment on. But the lack of factual support undermines any associations or conclusions she might draw about Freemasonry. Hancox, Joy. 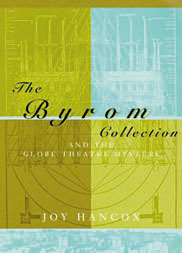 The Byrom collection and the Globe Theatre mystery. London : Jonathan Cape, 1997. 320 p. : ill. (some col.) ; 25 cm.